What determines carving tools/chisels quality? I wish to get into wood carving I just don't know where to start and what I should be looking for when looking for a set of carving tools. What determines the quality of one set over another? Yes, I understand some sets come with more tools and that can be the reason behind a price difference but then I see some sets with no more than 1-2 extra tools that have extremely varied prices. In other areas of woodworking tools I can see why one brand would cost more than another because of quality, manufacturing, and material differences but when it comes to carving tools the only one I see applying is material differences but even then I don't believe that would account for the degree of the price differences. Which are typically most important to new woodworkers? Any info anyone can offer is gladly appreciated. This is actually a pretty broad topic, but other than marketing decided price (brand A being more expensive than brand B simply because of the brand name) there may be large difference in manufacturing of the chisels that can affect price. I'll address general woodworking chisels, but I suspect that the same applies to the various carving chisels (as well as for turning gouges). The basic requirements from a chisel (in my view) are good edge retention and easy to sharpen to a very sharp edge, so you get a sharp edge that lasts a long time during work. These two are almost opposite in their demands from the tool, but high end chisels achieve them both. Metallurgy - the exact formulation of the steel used in the tool is extremely important for its performance. It is not that the components of the steel are expensive, it is that getting the precise ratios of different elements in the alloy takes knowledge, experience and tight tolerances on production. All of these cost money. Heat treatment - this is also an important step that requires all the knowledge and experience as the alloy formulation, and it needs to be exact for each individual chisel (not just the batch of metal used). For example, the kilns used for heat treatment must be uniform in temperature, or some chisels will be too hot during treatment and some too cold. This costs money. 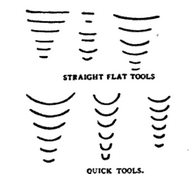 A unique feature of chisels (and plane irons) is the back hollow - since a chisel will often be resharpened by the end user, a hollow back will facilitate this. This is typically done by choosing the hollow face of the chisel blank after heat treatment and using that side as the back. This is an additional manual step in production. Manual steps cost money. Quality of initial sharpening and finish - grinding the chisel flat and true, creating the cutting bevel and honing the edge are all steps that take time. Cheap chisels may be completely dull right out of the box, while quality chisels are typically well finished (although these are often expected of the end-user to dress and sharpen before first use). Quality of the handle - both the choice of the wood (or plastic) and the structure of the handle (with appropriately sized reinforcements). A cheap chisel might have a thin and weak retaining ring, with the handle made of softer wood or with less attention to the grain being clear and straight. There are probably more parts that can cost money (like the box/bag the chisels come in, different widths costing more, etc. ), but I think the above are both the most crucial to the chisel's performance as well as being the most expensive in production. Well from what I can think off hand this might be helpful for you. 2) Cut/grind. I got some cheap chisels this week. They were $5 for 3. They cut fine but when you look up at the tip it was not pretty. There were plenty of little nicks if you will. So you may need a whetstone or something to fix that. Even sandpaper works. As for bevel just keep it as is. Others I think mine is about 25-35 degrees. You forgot one other important factor, which is paying for the name. Unfortunately there's a lot of this in woodworking and it extends through all levels of tools (both power and hand). You tend to pay a premium for established name brands and the better the name's reputation the greater the additional payment. And this additional money does not necessarily net you a greatly superior tool. This is not to say you can't get what you pay for when you buy an established name, but unfortunately paying a premium price is not a guarantee of getting a premium product. The 'sweet spot' for steel in chisels is arguably now CrV, an alloy of steel containing chromium and vanadium which give some additional benefits over basic carbon steel without adding greatly to its cost. As a result inexpensive, even cheap, chisels can now be of more than merely acceptable quality, as shown by the very inexpensive chisels sold by the Aldi chain that were plugged for many years by Paul Sellers as being the best buy in all of woodworking. The above being said the heat treat is everything, and no matter the quality of the steel it can be wasted if it's not heat treated well — the edge won't be worth a damn, if too hard it'll be prone to crumbling or cracking, if too soft it won't hold an edge for long as well as being prone to what's called edge folding which is exactly what it sounds like. The good news is that if you do get a chisel that is too hard or too soft you can rectify this at home with simple equipment that won't cost much (if you have a gas cooker or range you may even be able to do it using one of your burners). This is extremely good news for any budget-minded carver as in addition to the obvious of giving you the ability to improve the quality of the edge of any cheaper carving tools you buy (I should stress here, IF this is needed) it opens up the possibility of making your own tools from scratch, either starting with cheap bench chisels or from raw steel stock1. What determines the quality of one set over another? One additional issue here is your focus on sets. Although this varies a little with some tool types it is generally acknowledged that sets are often not the great buy they appear to be — they tend to give you a few tools you'll use a lot, one or two you'll use infrequently and a couple you will never use. The larger the set the more this is true, for most people. On the other hand sets can be very affordable and give an introductory selection of tool types that you want to try if you haven't carved before so the appeal is understandable. But do be aware that you will very likely pay for one or two you won't use much or at all. The usual recommendation when new users are being steered away from sets is to identify the tools you're sure you'll need2 and buy only those initially. Once you start to price individual carving tools this sounds like a very expensive route and it can be if you go crazy and buy dozens of tools initially, but no beginner should do this. While many long-time pros have very large chisel collections (some are nearly unbelievably large3) you can do a lot with just a handful of chisels and a knife or two if you apply yourself and figure out how to shape. I have a sculptor friend, not a carver, and looking at his work and the minimal toolkit he uses to do it (the majority of which he made himself) has convinced me yet again of the fact that it's possible to do great work with minimal tools. In carving, at the other end of the spectrum from Grinling Gibbons we can look today at some of the virtuoso carvers in the Middle East and Asia working in dirt-floored workshops who sometimes only have about a dozen tools at their disposal! So my advice would be to get a few tools (in a set if you work it out and this is the cheapest way to get every shape you've identified you need) and then learn to use them to their fullest potential — this isn't carving for 10 or 20 or even 50 hours and struggling to do certain tasks, this is weeks of dedicated work, or months if you can only carve occasionally. Then go shopping for more if/when you find it's necessary. Even some very good tools won't be supplied fully sharpened. Cheaper carving tools (which may be of acceptable quality for you at this stage) will almost invariably be sold blunt, just ground to shape and with the expectation that the user will sharpen them before they're first used. If you do buy a set that's sharp just as with bench chisels you will need to sharpen them fairly soon after you buy them because they will blunt slightly through use (the harder or more abrasive the wood your work with the faster this will occur). More sharp is always preferable to less charp obviously but carving chisels in particular are very often used cross-grain, this requires the best edge you can manage for the cleanest cuts because you're consistently working show surfaces that won't be cleaned up or refined afterwards. There are numerous previous Q&As related to sharpening here if you need some guidance in this area. If you don't have anything currently at the least I would recommend getting some quality abrasive paper (wet/dry type) up to 600 grit and making yourself a strop. A lot is said about the need for good handles on chisels generally and carving tools as well. So broad agreement there, what there isn't broad agreement on is what constitutes a good handle. It's very much a matter of personal preference and hand size what makes a good handle. What one guy likes another won't mind, and you can bet you'll find a third who loves them. So don't be completely put off by someone else's hatred for a handle type due to material (e.g. they hate plastic) or size (two common complaints being "They're too big" and "They're tool small" so you can see that it's hard for manufacturers to win that one LOL) or shape. You can remake existing handles to better suit your tastes, as shown by Paul Sellers on the Aldi chisels. The handles on the Aldi chisels are not widely liked so there are also many re-handling jobs out there online to find (including by Mr. Sellers) and they range from the utilitarian to the extravagant. Remember this above all: you're a woodworker, if you need to you can make a set of handles for yourself! Although if you pay a lot for a tool you won't want to sometimes this is the best route to getting a handle that you like best. Even some pretty high-end chisels (e.g. Veritas, L-N, Sorby) have had the DIY handle treatment to better suit the tastes or requirements of their owmers, so complete replacement is by no means confined to cheaper chisels with mediocre handles. 1If you're interested in this there are many resources online you can tap, but a great starting point would be Make Your Own Woodworking Tools: Metalwork Techniques to Create, Customize, and Sharpen in the Home Workshop by Mike Burton. 2Use a number of books and online guides to determine this, not what looks like it will be useful to your untrained eye. You can use your own judgement in the future to buy selectively once you have some experience and have identified gaps in your tooling that would be useful or essential to fill, but initially it's of little or no use. 3The famous Grinling Gibbons is said to have left a collection of carving tools numbering in the thousands when he died, although it's not clear if he used all of them his 'working set' was in the hundreds apparently. This obviously does not include v-notches, punches, picks and other essential utility shapes. Altogether a complete set of shapes might include 60 different tools. At $50 per chisel, that is $3000. Good tools have good steel, grinds, flex correctly for the type of wood being used (if it is hand carved), or have good ferrules if used with a mallet, and have the right temper. All of this stuff will be hard to judge for a beginner, or even for an expert. Some chrome-vanadium steels are crap, others are high quality, can you tell the difference? Many experts can't even tell the difference. One of my pet peeves is that virtually all commercially sold chisels have handles that are too small. A handle should fill your hand. The main thing you want to do is limit yourself to a very simple, very specific type of carving and get the exact tools needed for that type, then branch out from there. Once you start doing work, it will become more obvious what kind of tools you find most useful. Not the answer you're looking for? Browse other questions tagged hand-tools tools tool-selection carving or ask your own question. What should one consider when purchasing an intro turning chisel set? What is this turning process on the woodworking Wikipedia page? Old carving gouges — why so thick?